Auslauf Modelle zum halben Preis! Developed specifically with the student in mind, (although many professionals use them as well), these mouthpieces offer the same rim (similar to a 3C*) on 15 different cup depths, graduated at .006 in. intervals, (the equivalent to the thickness of two human hairs. 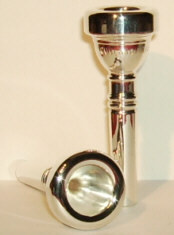 ), from deepest (No.301) to shallowest (No.315), allowing the developing player to find optimal response from a mouthpiece with the same rim. For example, if a No. 307 is too deep and a No. 312 too shallow, the No.309 or No.310 may be the appropriate fit. Please note: No. 300 has the same cup depth as the No. 301 with an expanded cup diameter.